The winter school break is creeping up – have you made your childcare arrangements yet? Our School Break Camp list can help! The best part about this list is the abundance of flexible options available for Huntsville parents. Sometimes you just need an afternoon to shop/wrap/cook, ya know? In addition to that we’ve rounded up our favorite free & family-friendly events in North Alabama below. Be sure to check our huge Holiday Happenings Guide so you don’t miss something important! 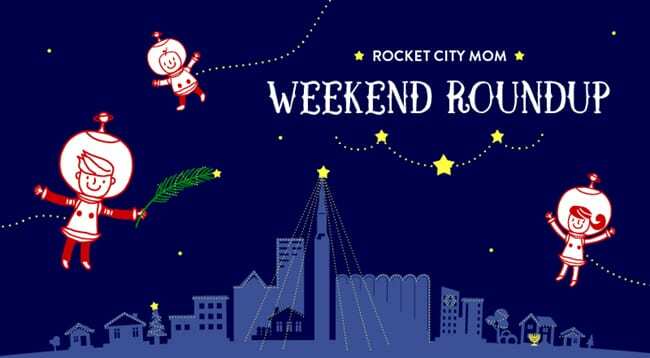 Our full Event Calendar also has more activities happening in Huntsville this weekend is you don’t see anything below that suits your fancy. Finally, check in with our Giveaways for the Holidays that we host every year for our most devoted RCM Readers. You’ll be glad you did! 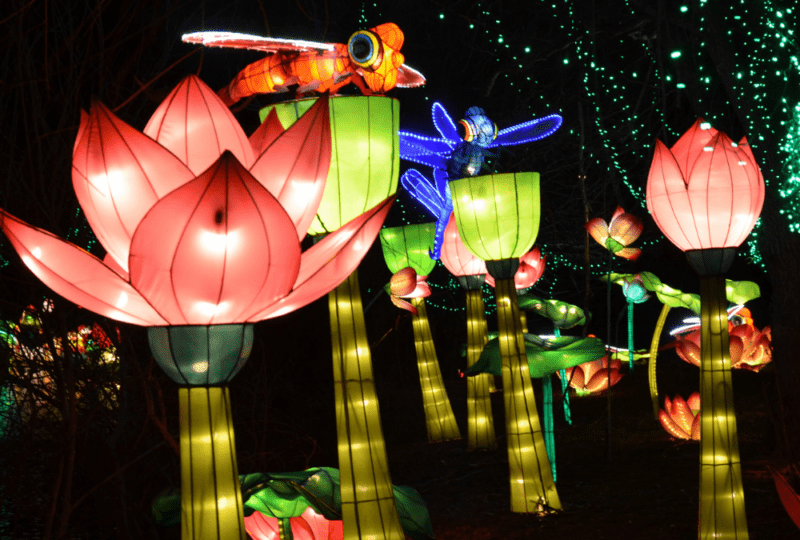 Gas up the car, bundle up the kids, and go looking for Christmas lights all over Huntsville. We made it super easy with our master list with a MAP! No matter what corner of North Alabama you live, you can find free seasonal fun every night that includes gorgeous lit trees or festive decorations! Lights typically come on at dusk. Ideal for young audiences ages 0-5, these holiday puppet shows at the Library are tons of fun! Families are invited to craft together & make snowmen, ornaments, and reindeer. A spectacle of sight and sound, over 150 singers, a 50 piece orchestra and thousands of lights bring a 39-foot Christmas tree to life. There’s even a Children’s Night! Tickets are now only available by pickup at the church or by calling (256) 428-9422. Everybody loves a parade, and there are a couple to choose from this weekend! Click the orange titles for details. Learn about the different Christmas traditions all over the world, enjoy refreshments, and meet Santa! This annual free concert by the Madison City Community Orchestra will get you into the spirit with all your favorite Christmas songs. Two words: breakdancing Frosty! This popular show in Decatur has been running for 20 years. Read our review before you go. Children can visit with Santa while enjoying free snacks provided by Downtown Gadsden, Inc.
You’re invited to the grand opening of a new mobile 3D Printing space at the Library! Come and learn how to use 3D Printing to make your own gifts for the holidays. Magi from the East: Gaspar and Melchior crash this VBAS show with gifts for the young ones and treats for all others. Each year kids can explore several possibilities of the Christmas Star, including comets, meteors, novae and other phenomena. This special holiday market will include all the produce, meat, and cheese you usually find, plus baked goods, greenery, and homemade gifts. There are a couple of great opportunities around Huntsville & North Alabama to meet up with Santa for free/cheap this weekend! PSSSST!!! You’ll find even more free events in our full Event Calendar! The congregation of the Old Country Church will hear more than two-dozen Christmas carols, many of them vintage hymns, and hilarious yuletide stories from the more or less devout Sanders family members. See the full show schedule. All your favorite Marvel heroes assemble to fight evil right here in the Rocket City! Visitors will be able to play in Imagination Place, Let it Snow, join a guided tour of Festival of Trees, watch The Polar Express movie, create a special craft, and ride on the miniature “Polar Express” train in our rear parking lot. Snacks with Santa is from 10AM – Noon. Santa will be all laced up and ready to skate. Get your picture taken on or off the ice with Santa in our Skating in the Park winter wonderland! Galaxy of Lights is an award-winning holiday light extravaganza featuring larger-than-life animated light displays. Put it on your Must List. Check their calendar for discount nights! All ages will delight in visiting Santa’s NEW house at the Depot! Meet reindeer and the North Pole elves, play in the snow, enjoy musical entertainment and more at the Village Santa calls home. Save a buck on the ticket price with this coupon. Download the free Explore Huntsville app for great deals & to get all the best RCM info on the go! Got a great kid’s event you’d like to see in future Weekend Roundups? Let us know. « 2018 Christmas Light Displays in Huntsville & North Alabama	» Win Tickets to Skating in the Park in Huntsville!